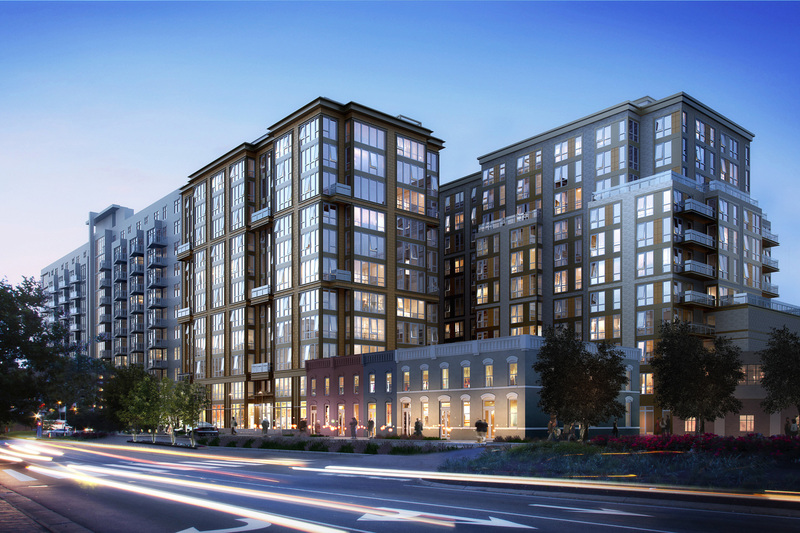 Development plans for the addition to Capitol Park Tower at 301 G Street have changed. Plans call for a seven-story, 270,000 SF building with 300 units – 8% of the building area will be set aside as affordable units. A 350-space garage will provide parking for the new and existing buildings. Gone is the four-story addition on the northeast corner of the site that fronts Capitol Park II. Also, the pool will remain, but it will be refinished. The pool pavilion, however, will be removed. The development team has proposed to enclose the open area of the first floor of the existing building with glass and turn this area into 20 apartment units, which will increase the total number of units in the existing building to 309. Last month, the ANC unanimously supported the plan, with a reservation about the building height. Zoning in the area is set at 60 feet, but the proposed addition is 74 feet. The development team is measuring the height of the building, not from the street, but from the Southwest freeway which abuts the site. The Office of Zoning approved that interpretation, even though the building will not be accessed from the freeway. By that measure, the new addition is 55 feet tall. In any case, the new building as proposed will be 12 feet lower than the existing building. The development team will need to go back to the drawing table in order to gain approval for the project. Earlier in the year, it was projected that construction would begin by November, but it’s now likely that start date will slip a bit. Aside from fish and more fish, Requin is expected to feature an old-fashioned cheese cart, dry-aged bone-in ribeye steak, seafood roasts and the largest wine menu of any Isabella restaurant. The place sounds almost like a fine-dining restaurant, but Isabella says it will remain casual, befitting the style of his other properties. Prior to opening at The Wharf in 2017, Requin (which means shark in French) will open as a pop-up restaurant this fall in the Mosaic District in Merrifield. This will give Carroll a chance to refine the concept before the debut at The Wharf. Back in March, Isabella and other celebrity chefs were rumored to be opening restaurants at The Wharf. We’ll see who else makes an announcement in the coming weeks. Another bit of news from the article is that Isabella will be buying one of the condos at The Wharf, presumably at VIO. The SWBID will be doing a clean-up of 4th Street tomorrow from 9am to 1pm from E Street to I Street. Residents are asked to move their cars from this section of 4th Street for the duration of the cleaning, but if they cannot be moved from the street, then they should be parked at least one foot from the curb to allow access to gutters. This will be the first street cleaning the BID is doing since it was formed and is using it as a test to see how long it will take to do in the future, as well as the best time of day to do one. Volunteers are also need, so contact Merrit Drucker (202-440-0733) if you are interested in helping out. Also tomorrow is the 4th Annual Cantina Cup Regatta, which will take place along the Washington Channel from 10am to 4pm. Proceeds from the Regatta give DC Sail financial report to continue to provide community access to sailing and boating safety programs. The after party will be at Cantina Marina from 5-10pm. Field improvements will soon begin at Randall Field. A partnership between DPR/DGS, the Washington Nationals Dream Foundation, Cal Ripken, Sr. Foundation, and Under Armour have teamed up for the effort, which includes a new turf field, scoreboard, and dugouts for youth baseball/softball and soccer. The position of the ball field on the southwest corner of Randall Field will shift from its current configuration to the northwest corner. A turf field will do a better job of water drainage than grass and will result in more use of the field. Only one of the fields will be turf – the other ball field on the southeast corner will remain grass due to lack of funding. According to Mark Bacus from DGS, there will be a seamless transition between the turf and grass field. The revised plans for Randall Field were presented at a community meeting on Tuesday evening. Most of the attendees seemed to be in support of the changes, but there was some opposition from those who currently use the field for adult leagues. The changes to the field will accommodate youth sports to the detriment of adult sports leagues due to the source of donated funds for the project. Construction on the field should be complete by early November. Funding for this project only covers the ball field area – there is currently no funding available to make improvements to the tennis and basketball courts. However, other areas of Randall have recently been improved or will soon undergo renovations. Earlier this summer, the playground reopened at Randall with an ocean life theme and construction activity at the community center building began in late July – new windows and doors will be installed and should be done by September. The window and door replacement was funded by a $200,000 donation from The Bernstein Companies as a part of the PUD agreement for their Town Square East development. In addition, DPR has $250,000 available to make ADA-compliant improvements, but they are seeking more funds in the FY 2017 budget to make additional improvements. There was some confusion at the community meeting about where the $250,000 came from and whether there was additional funds available in the budget for improvements (for instance, $250,000 was secured in the soccer stadium community benefits agreement for improvements to Randall). DPR wanted to solicit ideas from the audience for what additional improvements should be made, but the majority of the time allotted was used up by discussion about the ball fields and amount of renovation dollars available for the Community Center. Therefore, a follow-up community meeting is scheduled for August 26 at 6pm to brainstorm ideas for renovating Randall Community Center. In about three months, the newest Hyatt Place in DC will be opening at 400 E Street, a mixed-use project developed by E Street Development Group and designed by WDG. I was able to get a hard hat tour of the project from Stacy Smith and Carl Barnett from Hyatt Place last week. This project has a special place in my heart since it was the subject of my very first blog post back on June 4, 2008. Hyatt Place Washington DC/National Mall is a 214-key select-service hotel. Service is key at Hyatt Place, which offers “casual hospitality in a smartly designed, high-tech and modern environment.” All Hyatt Place hotels have free Wi-fi and breakfast is included, as well as 24/7 access to freshly-prepared food at the Gallery Market (for a fee). The same person who checks in a guest is also capable of preparing a meal, making an espresso or a cocktail. The main entrance to the Hyatt Place Washington DC/National Mall is located on E Street, where elevators take guests to the lobby lounge on the third floor. At the lobby lounge, guests can check-in; use free computers and printers at the e-Room; pick up a sandwich from the Grab n’ Go case; eat at the Gallery Market (non-hotel guests can also order and pick-up food any time of day or night); get a drink at the Bakery Café, which serves Starbucks by day and wine, draft beer and spirits in the evening; work out at the 24-hour StayFit Gym which faces an outdoor pool; and socialize outdoors on the Gallery Terrace. There are also five meeting rooms with over 3,000 SF of flexible event space on the second floor. The fourth floor contains back-of-house operations for the hotel and administrative offices for KidPower, a local non-profit organization. Future location of front desk and bar. View from Gallery Terrace still U/C. Rooms begin on the fifth floor (with the exception of a few on the third floor) and are a mix of king-bedded rooms, queen-bedded rooms, 16 king suites, and eight studio suites. All rooms contain a 42” flat screen HDTV, mini-fridge, separate workspace, Cozy Corner sectional sleeper sofa, in-room safe, and luxury skin and hair care products in the bathroom. King-bedded rooms have stand-up showers and queen-bedded rooms have a tub. Cozy Corner sectional sleeper sofa. A rooftop bar will be open to the public and will have a menu distinct from the Gallery Market. The rooftop bar will be open seasonally from 8am until 2am during the week and 3am on the weekends. Stacy and Carl say that the yet-to-be-named rooftop bar will be a unique destination in the District that will be unlike the POV at the W Hotel or Donovan House. They have been looking at rooftop bar concepts from across the country for inspiration and expect to have great food and cocktails. Rooftop view to the south. Roll-up bar area on rooftop still U/C. 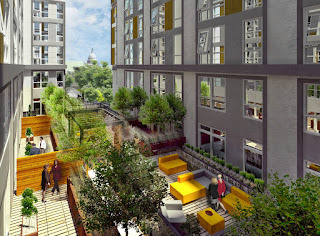 Reservations are already being accepted for stays at Hyatt Place Washington DC/National Mall beginning in February 2016, but once an exact opening date is announced for the hotel, reservations will open up for dates closer to opening. Rates start at $159, but Southwest residents will receive a 20% discount on the best available rate and holiday specials will be available. In addition, job postings will soon go up for the hotel. 400 E Street is a true mixed-use building, which in addition to Hyatt Place will also include 1,400 SF of ground floor retail at the corner of 4th and E streets and a firehouse along 4th Street. The retail space is envisioned as a market or deli and the firehouse is the first newly built facility for DCFD in nearly 30 years. When a call comes in and a fire truck leaves its bay, the traffic signals will synchronize, allowing the fire truck to leave the station without the need to blare its horn, which hotel guests will surely appreciate! In addition, the windows are triple-paned to keep out any noise from the Southwest freeway next door. Red facade going up on firehouse. Inside one of the firehouse bays. Prior to becoming a hotel/firehouse, 400 E Street was a District-owned lot used as parking and at one time was a gas station. E Street Development Group was awarded the rights to develop 400 E Street and a second parcel at the existing Engine 13 site at 555 E Street back in 2009 by DMPED through a 99-year ground lease. Back then, 400 E Street was planned as an office building with a firehouse below, but due to unfavorable office market conditions, the use changed to a hotel. Construction began on phase one in December 2013. A second phase is planned for 555 E Street. An office building with ground floor retail was originally planned, but according to DMPED’s new Project Pipeline Database, the current plan for the site calls for a 193,000 SF multifamily building, an 89,000 SF hotel, and 15,000 SF of retail space. Construction on the second phase is expected to start in 2017. 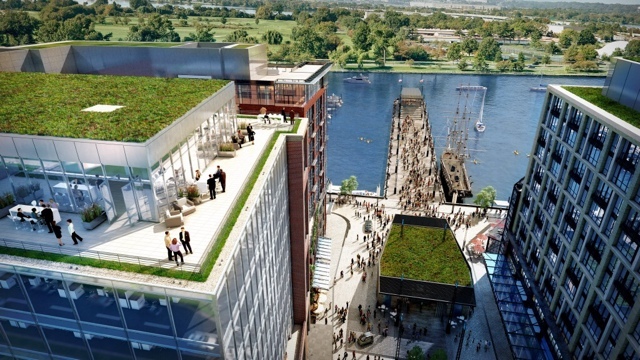 The combined hotels will include café/bar and other dining options; a 1,100-square-foot fitness center; 2,500 square feet of meeting room space; a courtyard with outdoor terraces and water features; an outdoor pool; and a rooftop bar with Washington Channel views. The penthouse will include an additional 10,000 square feet lounge area with sweeping views of the Potomac. Canopy by Hilton is the energizing, new hotel in the neighborhood offering simple guest-directed service, thoughtful local choices, and surprisingly comfortable spaces, so guests simply feel better going forward. Each property is designed as a natural extension of its neighborhood, with local design, food and drink, and delivers a fresh approach to hospitality and the guest experience. The Wharf location will have 175 keys and will be one of the first to open in the world. Canopy will be located closest to 7th Street Park. Hyatt House is an extended-stay hotel brand launched in 2012 that has more than 60 locations in the US – three in the Washington metro area. 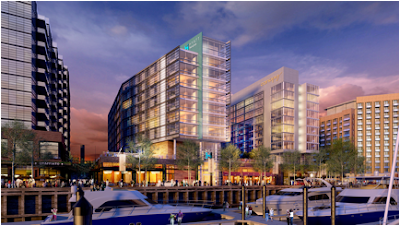 The Wharf location will have 238 keys and will be the first Hyatt House to open in the District. These two hotels will join the InterContinental Hotel in the first phase of development at The Wharf and all three hotels will be open by the end of 2017. A fourth hotel is currently under construction in Southwest – Hyatt Place Washington DC/US Capitol at 4th and E streets, which is further along than The Wharf and is scheduled to open this November. I took a hard hat tour of Hyatt Place yesterday, so be on the lookout soon for a post on this project. 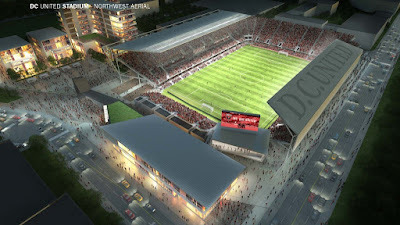 The new stadium will create a unique atmosphere to watch the game. It will be both intimate and intimidating, putting fans close to the action and creating a home field advantage. An interactive plaza will link to ancillary development that functions as a gathering place for fans and the community 365 days a year. 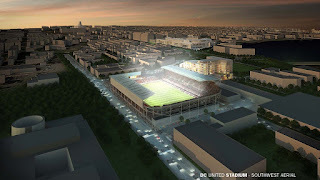 The stadium will also be eco-friendly and provide connectivity to public transit, including the Metro, Bike Share and [the DC Circulator]. The city and the team finalized an agreement in June which calls for the city to gain control of the land for the stadium by the end of September. A 2-acre portion owned by Akridge is still not under the city’s control, although it has the authority to use eminent domain if an agreement isn’t reached with the developer by the September 30 deadline. The new DC United stadium is expected to start construction in 2016 and open in time for the 2018 MLS season. Back in June, Republic Properties presented revised designs for their planned residential building at The Portals to the U.S. Commission of Fine Arts. The apartment and condo building at 1331 Maryland Avenue, designed by Robert A.M. Stern Architects will be the first residential component of the mixed use project, which includes 1.5 million SF in three office buildings, the 400-key Mandarin Oriental Hotel, and ground floor retail. In fact, the proposed project would be the first residential building constructed north of the Southwest freeway and south of the National Mall since urban renewal. The project is planned as 290 apartment units and 75 condo units on the top four floors in a 13-story building. Aside from the planned residential building, a fourth office building (Portals IV) is planned on the remaining vacant parcel between 1331 Maryland Avenue and the Mandarin. In their June 26 letter to the developer and architect, the Commission endorsed the proposed revisions, which include the addition of 23 inches to the height of the building as well as adjustments to the façade. The entrance to the condo building was moved away from the Maryland Avenue circle and alterations were made to an interim plaza between the proposed building and a future phase. Construction is expected to begin sometime in 2016.